This is a very important time in your life, and I want to take the most care to capture lovely images of you, and your beautiful baby bump. We will spend 1-2 hours together, taking time to relax and enjoy the process. I encourage you to bring along your partner for some special photos of the two of you together. Some people wish to bring along older siblings for photos, and I welcome this also, as long as another adult is there to entertain them while I focus on mom. Pregnancy photos can be done in my home studio, at a special outdoor location, or a combination of both within the Gananoque/Kingston area*. I can bring my studio lights and backdrops to your home for an extra fee**. You will get 10 edited digital images for printing and sharing. Newborn photos are best taken in my home studio, where my lights and props are close at hand, however I can bring my studio lights props and backdrops to your home for an extra fee**. The best time to take those perfect photos of tiny baby toesies and nosies is within the first 2 weeks- the newer the better! I will take my time with you and your baby to get those perfect poses, so plan for an hour and a half to two hours. Sleeping babies are easiest to pose, so we will spend lots of time rocking and shushing baby to sleep! My studio space will be cozy & warm, with calming white noise sounds playing. We will take some pictures of baby alone, and some with mom and dad. If you have a special interest or hobby, tell me about it, and we can decide how to creatively reflect that in a picture. For example, if one of you plays baseball, bring along your glove, and we can pose tiny baby in the palm of your giant ball glove. I have props and hats of my own, but I welcome your ideas. If you would like me to take extra time and extra pictures with siblings or other family members, we can extend our session by 1/2 hour for a small fee. 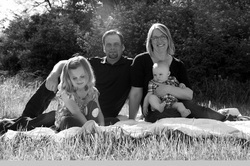 Depending on the age of your baby, we will discuss the best location and theme for pictures. You may wish to include parents or siblings. Unlike sleepy newborn pictures, you should choose a time when your little one is most likely to be happy, alert and playful. You can bring along 2-3 of your favourite outfits for your little supermodel, and a favourite toy. A favourite session is "Smash the Cake" for a first birthday. I will spend 1 hour or sometimes a bit more with you and your little one to ensure that I get the best smiles. Please speak to me, and together we can choose the best location to reflect the needs of you and your family. The engagement session is the ideal time for us to get to know each other before your wedding. A relaxed session is best, in a setting where you feel comfortable. We will spend about an hour together, walking, talking, laughing and capturing some great romantic moments. Your wedding day doesn't just start when you say "I do", so I will meet you to capture those priceless moments as you prepare- from the details of your jewellery and shoes, to that final moment when your bridesmaid or mother fastens your wedding gown. I will take pictures before and during the ceremony- so be sure to find out what the expectations are of your minister or wedding officiator for your church or hall. After the ceremony, I recommend planning for 2 hours at a location of your choice taking posed photos. If you want me to stay to capture those funny moments during speeches, that romantic first dance, or candids of your guests at the reception, I can stay for your dinner and through the first portion of the dance for an extra fee. The number of images you receive will depend on the length and flow of the day, as well as time allowed for posed photos. I will carefully sort and edit images for quality and style to ensure that your day is represented from beginning to end. All images that pass this process will be released to you, with print rights up to 8x12. Typically wedding galleries contain hundreds of beautiful images. Please contact me and we can have coffee to discuss the MANY personalized details involved in planning for wedding photography. Please contact me to discuss customizing a personal destination wedding package to your needs. The newest trend in wedding photos… don't box up your dress and hide it in a closet somewhere- be fun, be creative- you'll never wear that dress again, so TRASH IT! Come alone, come with your groom or come with your bridesmaids. We can meet the day after your wedding, or when you get back from your honeymoon. We can be as creative as you want to be. We can hit the beach, take a stroll through the woods, or find a location that suits your unique personality. Let's spend a couple of hours together having some fun. We can get it "just a wee bit" dirty in a location that you didn't want to risk on your wedding day, or we can take it all the way crazy and turn it into an art show! You will get 15 or more edited images for printing and sharing. Together, we will spend approximately 1 hour at a suitable location at or near my home, or within the Gananoque/Kingston area I like to plan for this length of time to give everyone time to relax and get comfortable being in front of the camera, so that I can capture an image that reflects your true personality. An ideal family session involves a walk through a favourite park, or stopping by locations that have important meaning to you and your loved ones. You will get 15 or more edited digital images for printing and sharing.